In Senegal, malnutrition affects over a quarter of children under the age of five, according to the World Bank, causing school attendance rates to suffer and drop-out rates to increase. At home, many children do not receive the nutrition they need to grow strong and stay attentive in school. Challenges to nutrition, health and literacy are intertwined, so it is vital to address them in concert through community-led and community-based solutions. 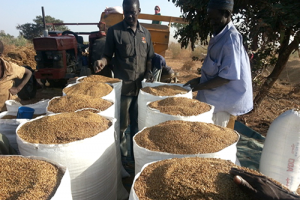 Conservation agriculture has helped millet producers better support their families in Senegal. With generous support from the U.S. Department of Agriculture (USDA), Counterpart International has been improving health and education in Senegal through the USDA Food for Education program since 2001. Under a new initiative, Counterpart and USDA will work directly with NCBA CLUSA and the Government of Senegal to improve the procurement of local and regional food for school nutrition programs. 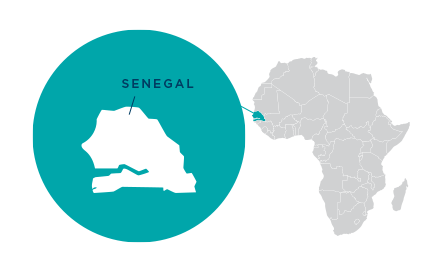 Known as the Food Transition for School Canteens in Senegal Program (TACSS, in French), the initiative will target primary schools in three areas—Podor, Dagana and Saint-Louis—and will help improve nutrition for 30,000 children in the Saint-Louis region. Working with other USDA projects in the region, such as NCBA CLUSA’s USDA-funded Millet Business Services project, this new three-year program will connect millet farmers and processors to school nutrition programs. These new partnerships will help to support additional activities with Counterpart’s McGovern-Dole Sukaabe Jaango project, which is targeting primary schools to transition to Community-Led School Feeding while also leveraging and incentivizing local agricultural production. TACSS will help strengthen the capacity of both community schools and the Senegalese Government to sustainably, effectively, and efficiently procure local commodities to supply school feeding programs. By increasing access to locally-grown and nutritious products like millet, cowpeas, mung beans and orange-flesh sweet potatoes, the program will also improve child nutrition and ultimately school attendance.